The 5810B Broadband Amplifier is an excellent choice for either pulse or RF applications. It is designed to produce a clean transient response. 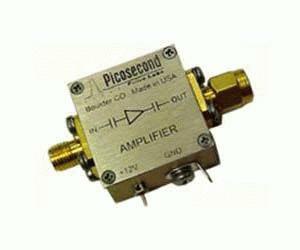 The amplifier is AC-coupled and is extremely broadband, covering 5 ½ decades from 6 kHz to 2 GHz. It has a clean transient response and smooth gain versus frequency response. This is a stable, 50 Ohm amplifier, and several can be connected in series to produce higher gain. The amplifier is packaged in a convenient, small metal module with SMA connectors and a built-in bias regulator.